A few weeks ago, Elizabeth Bird posed a question on her blog: Which Maurice Sendak book are you? Though I never had the chance to reply to her post, I knew my answer almost immediately. 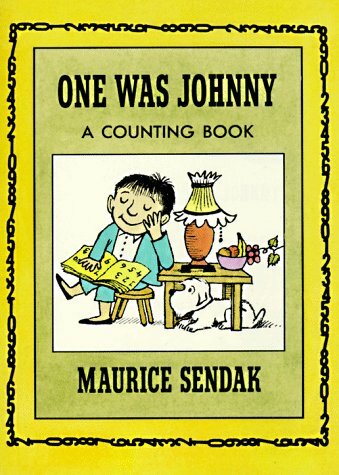 One Was Johnny, about a little boy who lives by himself and likes it like that, perfectly describes my introverted personality, and much of my behavior during childhood. Johnny becomes overwhelmed as more and more creatures invade his house, coming in uninvited and making themselves at home. A rat and a cat are bad enough, but things reach fever pitch when a blackbird pecks Johnny's nose, a tiger comes in selling clothes, and a robber steals his shoe. "What should Johnny do?" the text questions. His solution? He threatens to eat every last one of his guests if they don't leave before he finishes counting backwards from ten. This book represents everything I love about Maurice Sendak's work. He understands that somewhat darker side of childhood, filled with frustrations, annoyances, and worst of all, other, more obnoxious kids. So many children's books promote sharing, togetherness, and community. I can think of very few that sing the praises of solitude, and which demonstrate an understanding that sometimes other people are pushy and annoying, and we just want them to go away. This book rings so true because it doesn't force Johnny to share with his pushy houseguests, or to make room for them, or to apologize for wanting to be left alone. Rather, Johnny is the master of his domain and he throws all of those obnoxious creatures right out on the street! In my experience, well-meaning adults panic when kids show signs of wanting to be alone. They assume it means the child is dysfunctional in some way, or not a team player, but for the introverted child, and even introverted adults like me, the notion of all of those people in your space can be extremely overwhelming, and I think it's important to teach kids how to protect that personal space, and that it's okay to like being alone. As a counting book, this book doesn't work so well, since there aren't necessarily the correct number of countable objects on each page. It does work as a lesson in counting to ten, but I don't know that it really strongly illustrates the meaning of each number. Still, though, the illustrations, which are all drawn against the same background of Johnny's kitchen table, are greatly entertaining as the chaos of the scene increases, and the changes in Johnny's expressions could almost tell the entire story on their own. My fondest memory of Chicken Soup with Rice comes from my first grade classroom. My teacher, Mrs. Decker, would copy the poem for each month onto big easel paper and we would all read it together as a class. We also listened to the Carole King recording of the song so many times, that even today, I have it memorized. The book takes us through the entire year using various references and analogies to chicken soup. In January, the boy in the story eats his soup on ice skates. In February, he celebrates his "snowman's anniversary" (maybe the greatest concept for a holiday ever) by eating soup while the snowman eats cake. In July, he looks into the "cool and fishy deep" to find that "chicken soup is selling cheap" and in August, he becomes a cooking pot, and heats up chicken soup himself. Finally, the year ends with a "baubled bangled Christmas tree" decorated with soup bowls. Like In the Night Kitchen and Where the Wild Things Are, this book really demonstrates Sendak's unique and surreal outlook on childhood imagination. 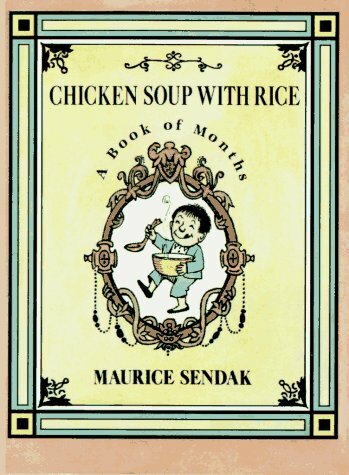 Chicken soup is a food almost everyone has eaten at one time or another, so the theme of the books feels very familiar and universal, but each monthly chicken soup experience could only come from the mind of someone like Sendak. Though I love the entire book - for nostalgia's sake as much as anything else - I do have two favorite pages. The first is March, when the wind spills the soup, then "laps it up and roars for more." I can remember being obsessed with that page in the classroom big book of this story, and enjoying the way the wind looked like it was alive. My other favorite is that August page, where the little boy transforms into a pot on the stove, and yet still manages to maintain the same facial features as his human self. As I mentioned last week in my post about Alligators All Around, I am most impressed by Sendak's ability to make his figures look like two things at once - alligators and lions, a boy and a cooking pot. 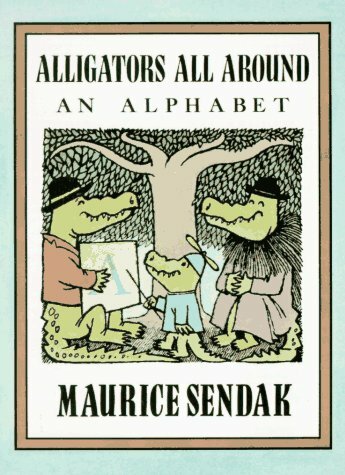 This alliterative alphabet book is one of four titles in Maurice Sendak's Nutshell Library. A family of expressively drawn alligators introduces us to each letter of the alphabet with simple two-word phrases that describe what one or more of the alligators is doing in the illustrations. Some pages are pretty mundane and serious, such as "M making macaroni," where the little boy alligator watches his mother stirring noodles in a pot, and D doing dishes, where mom washes and the little boy begrudgingly dries. Other pages reach the height of silliness, with activities like "entertaining elephants," "keeping kangaroos" and "wearing wigs." Some pages are even a little bit disturbing, such as the one for P pushing people, when the young alligator shoves a little boy and then stands there looking smug. My favorite page of all is L looking like lions, where each of the alligator family members wears a hairy mane around his or her neck and creeps in a menacing way off to the left-hand side of the page. I can't imagine how he pulls it off, but only Maurice Sendak could make alligators look like lions and alligators at the same time. For the most part, I think this book is brilliant and maybe even the best alphabet book I've ever read. There is only one problem, and that is the one flaw that truly dates this book. For the letter I, Sendak shows the alligators "imitating Indians." Because I know this is considered offensive nowadays, due to the inaccurate and degrading way it portrays American Indians, that one page does prevent me from sharing the book with kids in a public forum. It also keeps from including the book in my list whenever a parent asks for recommended alphabet books. Still, though, it's impossible to deny Sendak's brilliance, even with this flaw.